Italiensk Kulturforening i Stavanger - Filmkveld "The conformist"
Bernardo Bertolucci (16 March 1941 – 26 November 2018) was an Italian director and screenwriter, whose films include The Conformist, Last Tango in Paris, 1900, The Last Emperor (for which he won the Academy Award for Best Director and the Academy Award for Best Adapted Screenplay), The Sheltering Sky, Little Buddha, Stealing Beauty, and The Dreamers. 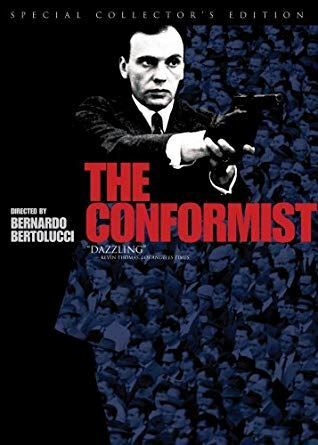 The conformist is 1930s Italian Marcello Clerici (Jean-Louis Trintignant), a coward who has spent his life accommodating others so that he can "belong." Marcello agrees to kill a political refugee, on orders from the Fascist government, even though the victim-to-be is his college mentor. The film is a character study of the kind of person who willingly "conforms" to the ideological fashions of his day. In this case, director Bernardo Bertolucci suggests that Marcello's desire to conform is rooted in his latent homosexuality. In addition to its strong storyline, the film is critically revered for the astonishing production design by Nedo Azzini, which, together with Vittorio Storaro's camerawork, recreates the atmosphere of Fascist Italy with some of the most complex visual compositions ever seen on film, filled with highly stylized uses of angles, shapes, and shadows.